This tutorial requires you to have iTunes installed on your laptop/computer. If you don’t, you can install it from the applications window or you can download it from the internet. 1. 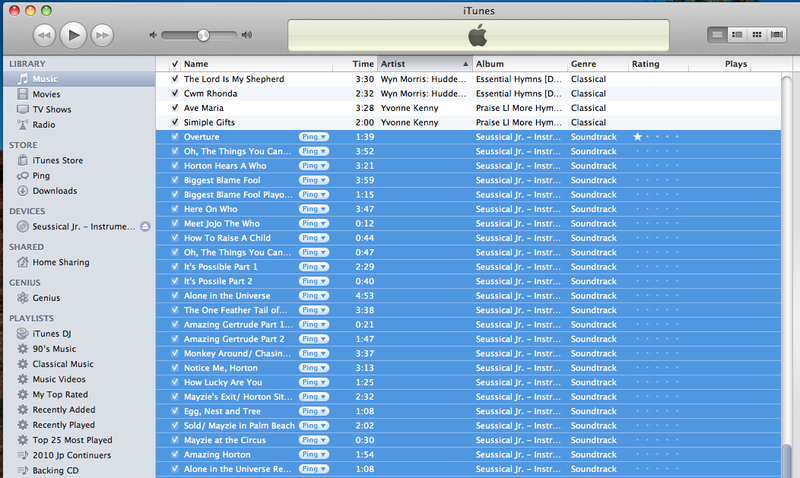 Open up itunes from the desktop or the start menu. 2. With itunes open, insert your audio cd into your computer. Once it has loaded, you will see it appear in the column on the left under ‘Devices’ (circled in red below). Click on the name of the audio CD here to bring up the track list in the main area. Then Click on ‘Import CD’ in the bottom right hand corner (circled in yellow below). NB: Depending on the source of the audio CD, it may or may not have the names of the tracks/album/artist etc. If not, it will simply say ‘Track 01, Track 02…’ etc and you will need to give your tracks meaningful names in a later step to avoid having 10 copies of ‘track 01’ after importing 10 CD’s, and not knowing which is which. 3. The tracks will begin to copy onto your laptop. The tracks that have been finished will appear with a green tick to their left, as well as the one in progress having an orange arrow to it’s left. In the green box at the top you can see the current progress of the import. NB: The following steps let you change the name/track info of imported tracks, very useful if you have imported tracks that come up as ‘Track 01, Track 02…’ etc. 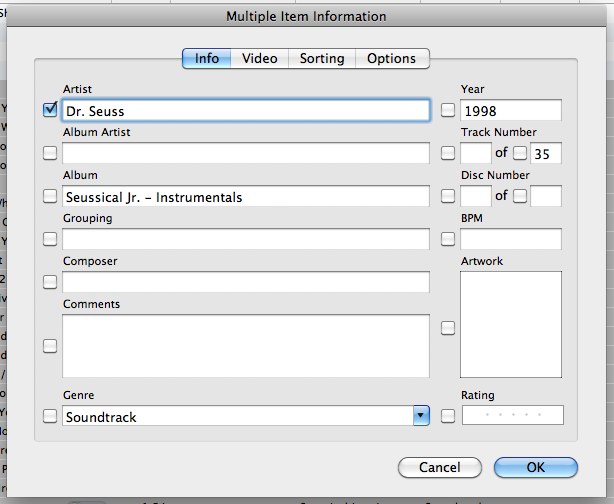 These steps are optional and if your imported tracks already have detailed information they may not be necessary. 4. Once all tracks have finished importing, you can remove the audio CD from your computer. Click on ‘Music’ under ‘Library’ in the left column to see songs that are stored on your computer. Locate the tracks you have just finished importing there. Click on the first track you have imported, then either hold down the ‘ctrl’ key and click on the rest of the tracks, or to select a group hold down the ‘shift’ key and click on the last track (which will select all the tracks in between). 5. 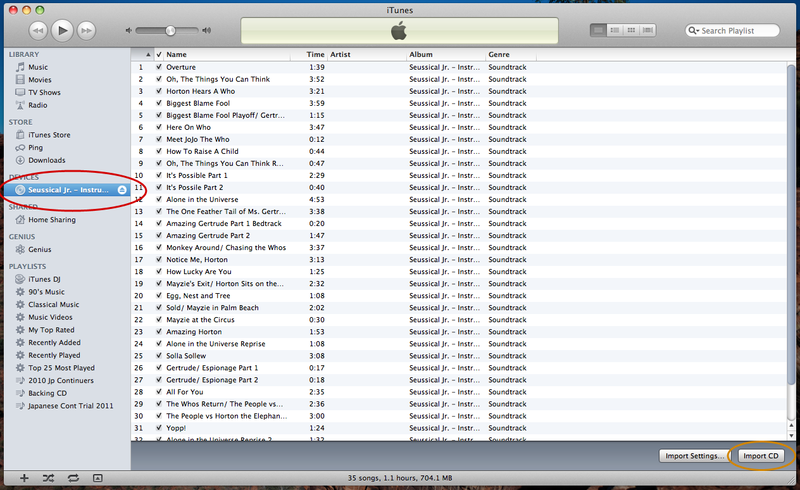 Once you have selected all the tracks, right click to bring up the menu below, then click ‘Get Info’. 6. Type in any details you wish to appear on these tracks as shown in the box below. If you wish to change track names you must do this one by one, however simply giving the tracks an artist and album name will be enough for you to identify them in the future. Click OK once you are done.